Funaki: Today it'll be just me and Momochi-senpai doing this MC segment. I would like to talk about something that's been on my mind for a while. Funaki: I've suspected this from when I was a Kenshuusei, and joining Country Girls firmed up my conviction. Funaki: Momochi-senpai, you're an alien, aren't you...!? Momo: ...Eh? Are you all right? Funaki: You're definitely an alien! Momo: There are reasonings behind it? Funaki: The sure-kill technique that Momochi-senpai always uses, the 'Koyubeam'. Momo: ...I haven't used it recently though. (bitter smile) Ah, wait, I have! Funaki: You're pinky is raised right now, isn't it? Momochi-senpai, you keep saying that it's an antenna that lets you receive the love of the fans. Momo: Yeah, it's an antenna. Funaki: No way that's true!!! That pinky is definitely linked to space! Momo: You mean like a real antenna? Funaki: Yeah. We've never seen the Koyubeam, but I'm sure that something green comes out when it's fired!! Funaki: After our 1st Hello! Sute together, I was expecting you to ask us, 'Were you nervous?' after it ended. But you turned pale, and said 'Gotta run, there's a timed sale'. Momo: I'd promised my mum beforehand! One person can only get two items, so we'd be able to buy four with two people. Funaki: That's what you say, but the truth is different. When the time comes, you'll return to your normal state! Your face puffs up and your skin turns green! That's why you had to go back quickly! You're completely an alien! Funaki: Take a look at how much I'm sweating. Humans are made of 70% water. Momo: I suspect that you just learned that fact. Funaki: And yet, there isn't a single bead of sweat on Momochi-senpai. She isn't even sticky! Why is she not sweating? Because she's an alien! Funaki: ...So Momochi-senpai, it's fine now. Was it difficult, not being able to reveal it until now? Momo: (laughing) ...When did you find out? Funaki: From a year ago. Momo: And you kept quiet until now. Momo: So, after the 30th of June, I've got to return to space... I've got no time left!! Please let me spend my time as a human being until the 30th of June. Funaki: Nothing wrong with humans and aliens living together on this world! This'll be a secret between the two of us. You guys, keep it secret too!! So that Momochi-senpai can reach the day of her graduation without a hitch, in human form! I'll be counting on you. Wondering what had happened, I saw an wota coming out of her lane, crying their eyes out. Ozeki: At first, I couldn't talk with Momochi-senpai. It was so bad that when I found out that I had to sit next to her on a one and a half hour Shinkansen ride, I blurted out that it would be tough on me . I got a really good scolding from Momochi-senpai when that happened. Momo: The seats next to me are the best seats in the house! 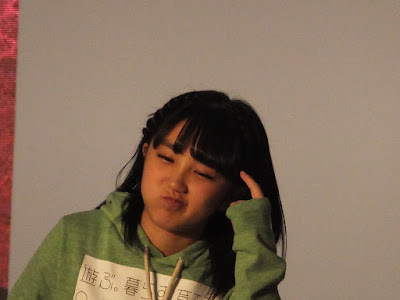 Ozeki: And then, at one point in time, we got on a plane that was really unstable. Momochi-senpai was seated next to me, and when the shaking was at its worst, she held on to my arm. Then I immediately put my arm across her shoulder. That was the moment when a link got made between my heart and Momochi-senpai's. Funaki: Frustration makes people grow. Momo: Where's this coming from all of the sudden? Momo: The HinaFes being a concert where all the H!P members perform. Funaki: Country Girls got to cover Ooki na Ai de Motenashite. When I heard that we'd be singing that song, I was reminded that there's a part that goes 'Nacky' in the song. And if you're talking about 'Nacky' in Country, well, there's 'Funacky'. So when I got home, I practised that part over and over again. I was so sure that it would be my part. I'd even apologised to the members for taking up such a juicy part. But when we got the lyrics card, I saw the the part had been assigned to TsuguYana. 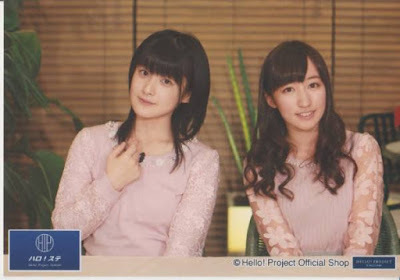 I can understand Momochi-senpai, but why Yanamin!? I would just go 'Oh yeah oh yeah' at the back. (Does the 'oh yeah oh yeah' with a sullen look on her face.) I was really frustrated. So I want to do it here, today! Funaki: Wait a second! Wait! Is that what you're saying? Momo: I heard 'Nacky'. (Indicating Funachan next to her) Who is this? How about saying the 'F' properly? Funaki: (In a good mood) Yaaay, that was awesome! Momo: (Also satisfied) I'm convinced. This is no longer ℃-ute's song. It's Funa-chan's song! Momo: I'd forgotten. I haven't really felt the generation gap between us recently when the six of us are working together. But when I listened in to the 5 of them at the MC corner today, they talked about learning how to look more mature. However, I've been studying up on how to look younger. So it is true: there are some things we do that are complete opposites. Funaki: We've started with our tour, and us students have also started with school. After switching classes for our third year, I've been split up from my best friend in my second year, who's gone to a different class.... That friend was the smartest in our school year, always getting first place in tests. Momo: (Shaking her head) ...That's not going to fly! Funaki: That's because all of Country Girls are bad at teaching! For science, Momochi-senpai was like 'Ampere is ANGERME's "A", and Joule is Juice=Juice's "J"'. Chii-chan peeked at the answers while she taught me, and yet she still got the answers wrong! Morito: I was going beyond the syllabus. You learnt more, didn't you? Yamaki: You got good marks on only one subject, right? For a supplementary subject. Funaki: Art! I got 69 marks! Yamaki: Guys, this is where you should applaud. Momo: And the 69 marks are the only one you're going to mention? Funaki: And so please teach me after this! End of discussion! Momo: ... No reward for you this time. Wota: Funakki, the thing I worry about when it comes to Country Girls from July onwards is that you won't study. Funaki: Don't worry. I'll still have to send my test results to Momochi-senpai. What are the Momochi-isms to you? Makoto: Well, we're at the final leg of the tour. Momo: It went by in the blink of an eye, didn't it? Makoto: Buono! is the day after tomorrow. Momo: That's right, at the Yokohama Arena. Country Girls will be there too. Makoto: Your last show will be outdoors. Momo: Yup. It'll be a bit of a ways from here, in Odaiba. Makoto: What surprised me when I heard about it was that you managed to persuade production to follow your requests. 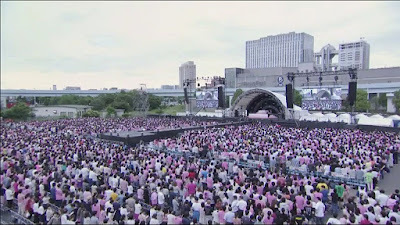 Makoto: Up Front Group doesn't really do outdoor concerts. As for why, like you just said, there's the risk of rain. And there are also the costs involved in setting up the stage. Momo: Well, they've got to build it up from zero, right? Makoto: The people at the office who are responsible for it told me that things really went according to your wishes. That made me have a better opinion of you! Your passion to perform outdoors as an artiste fired up the company. They were like, 'If she's going so far as to say it, let's do it.' How did you respond when the people at the office mentioned the possibility of raining? Momo: If that happens, wouldn't that make it legendary? Makoto: That's amazing! Extremely well done! Yanamin: The other day, I went for a meal with Miyazawa Marin-san. That's never happened with Momochi-senpai, so that's already a difference. And since I'd mentioned that I like hamburg steaks, she'd checked things out and even thought up a plan which had us going to a genuine hamburg steak store. And at the store, Miyazawa-san was like 'Eh, it's fine. I'll pay'. Yanamin: Momochi-senpai's pretty strict when it comes to expenses, right? Something like that would be unthinkable with her. The other day, Country Girls made an announcement about our future. We announced that we will be entering a new form, and I'm sure that it surprised a lot of you as well. All of you have said all sorts of things, but it doesn't mean that Country Girls will be no more. This might be the last time the six of us sing songs together, but the five of them will keep on singing after this. And to the members who'll be studying, study properly. And more than anything, all of you, please keep on praising these girls! From now on, I'll be counting on your support for Hello! Project and Country Girls, as well as for Tsugunaga Momoko, until the very end. 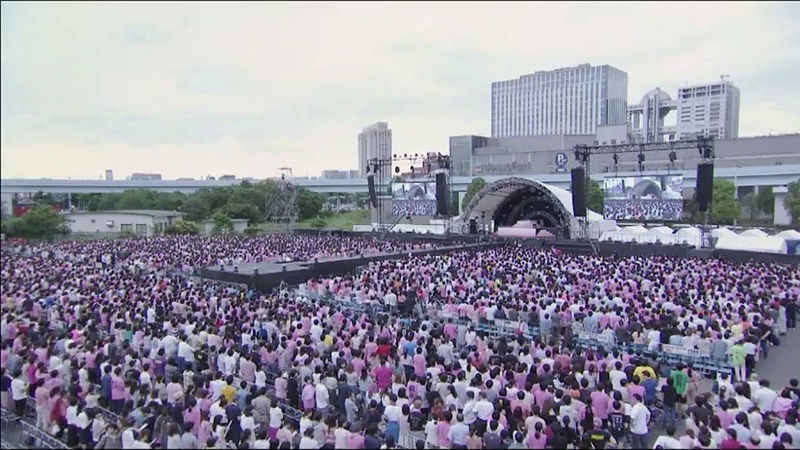 At this last leg of the Momochi-ism tour, the audience did a Momochi call after the encore. The Country Girls members came out and without microphones, wished the audience a 'Thank you!' before heading back off-stage. A final 'Momochi saikou' call ensued.